Recording what you found is an essential part of the research process. You should record the information in your own notes, FamilySearch Family Tree, and your personal genealogy database, (i.e. RootsMagic, Family Tree Maker, Ancestral Quest, Legacy Family Tree). 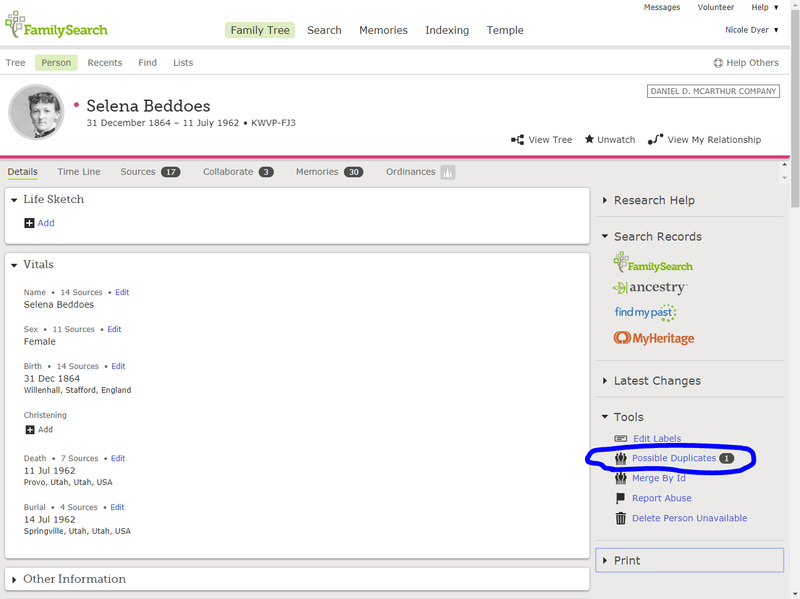 In the FamilySearch Family Tree, other users can view the person page for the relatives you are researching. They will see the information and reason statements you have added. If you do not add reason statements and attach sources, others may not understand your work and may change it. The collaborative nature of FamilySearch Family Tree is another reason why you should keep a record of your conclusions in your own notes and your personal genealogy database. If someone changes what you have added to FamilySearch, you will still have your conclusions in your personal files. There are many ways to record the information you found in the research phase. Write a summary of your research, attach sources, add new information, and add new people to the tree. If you have found several pieces of direct evidence that match easily with the person you are researching, you may want to write your conclusions in your relative’s life sketch on FamilySearch. This works well if information is straightforward and simple and doesn’t require in-depth explanation. If your research reveals information that requires in-depth analysis, you may want to write a report. This will help you make the connections, share your conclusions with others, and remember where you left off for the next time you research the same family. You can upload your report as a document in the FamilySearch memories section. If you don’t get around to writing a report, just upload your research log. Read about report writing here. 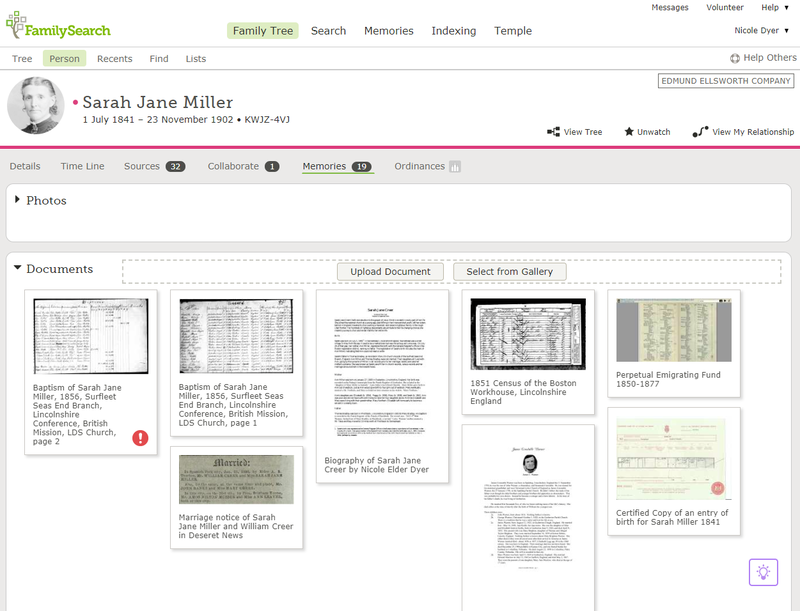 I wrote a report about Sarah Jane Miller and uploaded it to the documents section of FamilySearch Memories. When you make changes to a profile in FamilySearch Family Tree, you are asked to give a reason statement. For example, if you change a person’s birthdate or place, you will be asked why you are making that change. It is important to write your conclusions in the reason statement box each time you make a change, even if it’s just amending the reason statement that you added before. If you attach a source, you will also be asked to provide a reason statement. I believe that the 1851 census for Pearce Bradley in New Stranton matches the Pearce Bradley of Swineshead who married Jane Baldock because his first and last name match, and his birth year calculated from his age on the census matches his baptism date of 1821. The census indicates that he was born in Shutterton [Sutterton], a parish close to Swineshead where he was baptized. Pearce’s wife’s name on the census record is listed as “Mary Jane,” but the marriage record lists her name as just “Jane.” Mary Jane is probably her full name. The residence place on this census, New Stranton, Durham, is relatively far away from Pearce and Jane’s marriage location of Swineshead, Lincolnshire but Durham borders Yorkshire which borders Lincolnshire to the North. The census lists Pearce and Mary Jane’s daughter, Mary Jane Bradley, as being born in Swineshead, a helpful clue that they were married there and then moved to New Stranton. Another place to summarize your research is the “Notes” section of a person profile in FamilySearch. Choose a title for your note, then write your note. You may want to write a list of sources you looked for but didn’t find, or the questions you had when you were finished researching a person. Most personal genealogy databases also have sections for you to record notes. 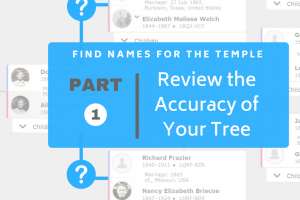 When you determine that a record matches your ancestor, use the FamilySearch Source Linker to attach the record to your tree. If you have found information on another website, you can use the RecordSeek browser extension to attach the source to your relative’s FamilySearch profile. This is found at https://recordseek.com. When you use Record Seek to attach sources from other websites, it is helpful to add a transcription of what the record says, or an abstract of the main details. Below is a video about how to attach sources from any website to FamilySearch using Record Seek. While attaching sources in FamilySearch with the Source Linker, you can add facts to a person’s profile, including residence, birth and death information, and so on. The Source Linker will not overwrite existing information, it will only add information about an event from if that event’s information is empty. For example, if you already have a birth year of 1836 for your relative, but you find the exact birth date on a headstone is 2 February 1836, the Source Linker will not overwrite the existing birth year of 1836. You need to go the person page when you are done with the Source Linker and manually change the birth date. Make a note of the information in the record, then update the fact after you attach the source. The standard format for recording dates is day, month spelled out, then year, i.e. 23 July 1902. The standardized format for recording places is to begin with the smallest jurisdiction and go to the largest. Include the county, state, and country, i.e. Tucson, Pima, Arizona, United States. As you add these dates and place names to FamilySearch, you will see that the system suggests standardized information for you. Be sure to select a standardized location when you enter the place of events so FamilySearch can make more accurate suggestions for research hints and possible duplicates. If you have found new people to add to FamilySearch Family Tree, go to the person page of the person you were researching and click “add spouse,” “add child,” or “add parent.” To add a new person, you must state if they are male or female, living or deceased, and how they are connected to someone already in the tree. The FamilySearch Source Linker allows you to add new family members found on a record to Family Tree. Simply click “add,” and the person’s details from the record populate the fields on a sidebar pop-up window titled “create new person.” You are asked to select whether the person is living or deceased. Only select deceased if they were born more than 110 years ago or you have a source confirming that they are deceased. Then click “Create a New Person.” Adding a new person is exciting. This means that you will be able to reserve their temple ordinances, unless you find a duplicate profile. In that case, their temple work may have already been done. More information on finding duplicates and merging will be discussed at the end of this chapter. Before reserving temple work for children, it’s important to confirm that they lived beyond the age of 8. If they died as a child, the only temple work that is needed is sealing to parents. You are not required to fill out the birth, marriage, and death dates and places for a person before you can reserve their temple work. However, you should look for these details and then add the most specific information you find. This information uniquely identifies the person and helps show that they are unique from others with the same name. FamilySearch requires the following information to reserve an ordinance for a relative: First or last name, gender, date of birth, christening, marriage, or death, place , of birth, christening, marriage, or death, death status (living or deceased). Before you reserve temple work, check FamilySearch Family Tree for duplicates that need to be merged. You can do this by clicking “possible duplicates” at the bottom right hand side of a person page in FamilySearch. 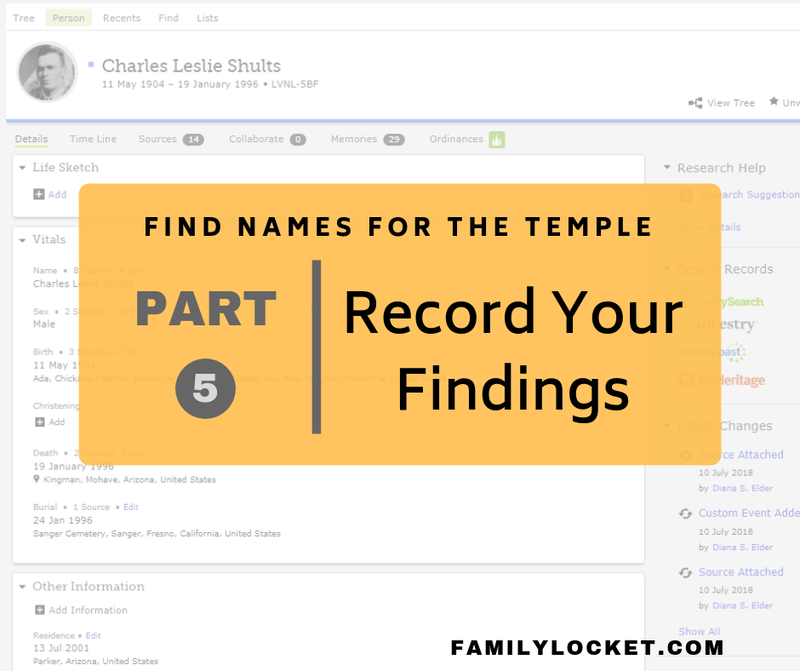 If there are no possible duplicates, then FamilySearch will allow you to reserve the temple work. 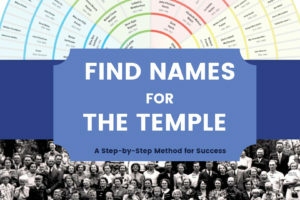 Do your best to find duplicate profiles before reserving temple ordinances for a person. 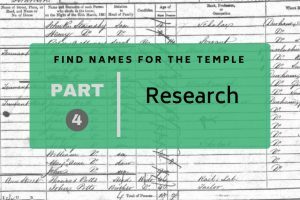 Duplicating temple work is a problem that LDS Church leaders have been trying to solve for several years and is the reason why the FamilySearch website was created. Before you do a merge, you should decide if the two profiles match. You can do this with the merging tool. At the end of the merging tool, you can select “cancel” or “not a match,” or “merge.” To determine if two profiles match, follow the same steps used in Chapter Four when deciding if a record matches your relative. The merging process puts the two profiles next to each other. Compare the details side-by-side. Be sure to check each fact carefully before merging. If you are not certain that the profiles refer to the same person, do not merge them. Do more research first. If you make a mistake, you can unmerge the profiles by going to the list of recent changes on the person page. However, after a change is made to the merged profile, the merge is much more difficult to undo. Do not merge profiles unless you are almost certain that they are a match. Merging is a complex process. The more you know about the two people before you merge them, the better. You may need to open their person pages in a new window and review the sources and additional details before you can merge. These two profiles for Mary Clark are for the same person. This is clear because they have the same spouse and the same death date and same county of death. Anna Jarvis and Hannah Gibbs are the same person. Hannah Gibbs married Henry Jarvis. Her name was recorded as Anna Jarvis in the household of Henry Jarvis in 1871, however her age, children, and birth place in Preston are the same. The census taker could have heard her name pronounced “anna” instead of “Hannah.” In subsequent census years, her name is listed as Hannah Jarvis. Therefore, Hannah “Anna” (Gibbs) Jarvis, wife of Henry Jarvis, is one person. If you feel that merging is a difficult task, you are not alone. President Henry B. Eyring told about his experience with merging two profiles in FamilySearch in General Conference. “Just a few weeks ago, I was working on my family history with a consultant by my side and another helper on the phone. On the computer screen before me was a problem beyond my mortal power to solve. I saw two names, sent to me by the wonders of technology, of people who might be waiting for a temple ordinance. But the trouble was that the names were different, but there was a reason to believe they might be the same person. My task was to determine what was true. The additional work you do to write about what you found and record the new information in FamilySearch will be greatly appreciated by all other researchers collaborating on the same relatives. It also helps to make a record that is “worthy of all acceptation,” meaning good, true, and accurate so that everyone will accept it. Best of luck! You can do it. Henry B. Eyring, “Gathering the Family of God,” April 2017 General Conference talk, article online, LDS.org (www.lds.org/general-conference : accessed 6 September 2018).